While driving to a doctor's appointment in downtown Atlanta , I discovered this beautiful graffiti wall on a partially abandoned building about 8 months ago. Instantly God gave me a vision for the photo shoot but I wasn't able to execute it until months later because of my finances. My anxiety was at a full time high at this time because I was stressed out. I just started my new job working with at risk youth, and I was struggling to catch up on bills and doing what I call "adulting". I wanted to plan this shoot because I know that when I'm my doing passion all my fears and anxiety instantly fades away. Its like magic when it happens! Planning a photo shoot can take months if you want it to come out seamlessly. The expenses from the outfit, photographer, hair, and makeup, nails, props, and last minute changes can set the photo shoot further in the future. While quick shoots still come out lovely, you want to make sure to execute the scene if this is your gift and your doing it for the love of art. I had to perfect this scene because I wanted to be one with the Art! You may have already figured out that I am in love with graffiti, art, historic & abandoned buildings. Well the graffiti in this area had my name on it! No matter how long it took I knew that the photo shoot would come in existence! May I remind you in June 2017, Is when I first saw this wall. 4 months later is when I spotted the outfit for the photo shoot. I had to give the vision time to develop and take it course. I couldn't just rush the process that God had tailored for me. As faith believers we have to allow it to naturally happen and not force it. I could have just picked out any cute outfit but that wouldn't have perfected the vision. 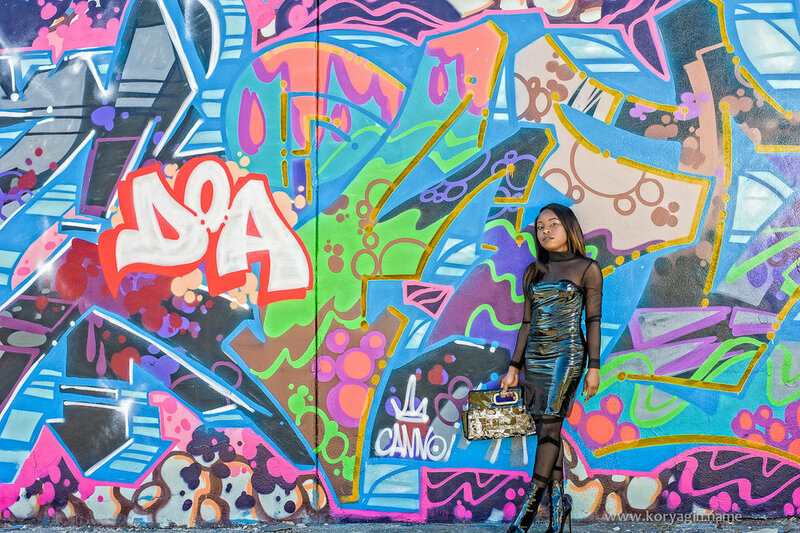 When I did come across this all black dress I knew something was unique and different about it. The clingy dress is street and bold. 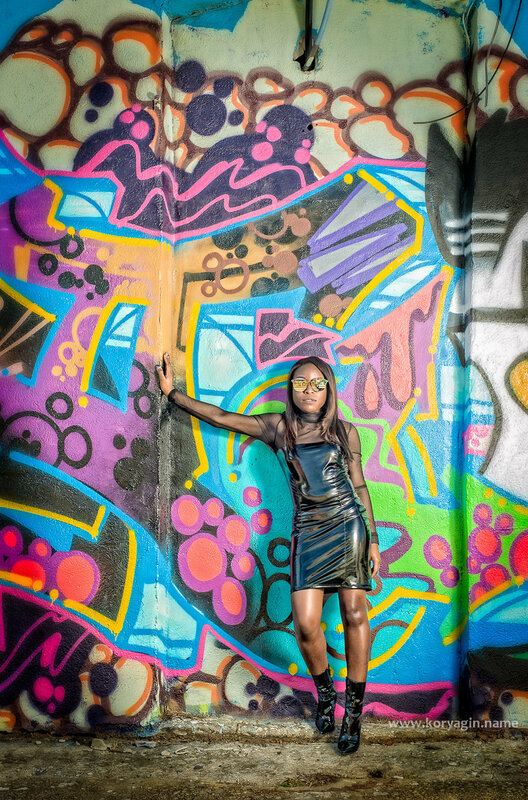 Its not your ordinary dress, and it shouldn't be.The graffiti on the wall is not ordinary. Someone put their soul and creativity in there art and I should do the same with my content and fashion. This is what makes me love art soo...much! The creativity, effort, and time these artist put in their work is astounding! In January when I did have my photo shoot I was nervous. It was after I put my 2 weeks notice in my job and I had to wait to start my current job. It was a new year, rent was coming up and I was waiting until my job to started, so yes that meant a delayed paycheck. I had to put my faith in God because in December I promised myself I would quit any job that had me so stressed that I couldn't have any peace. Here is when faith kicked in, I put my 2 weeks notice in before my current job even accepted me. Now imagine how my anxiety fluttered from high to low. During these last two months I went from being extremely stressed, to sometimes, happy excited about my upcoming photo shoot. When I finally found out I got the job I knew this was in God's plans! A week before the shoot, so much went on. I was sick with the flu, my sister was sick, then my mom became sick. Prescription meds were expensive. I wanted to opt out but my sister pushed me to go forward with the photo shoot & im sooo..glad I did! The day before the photo shoot I was so excited because I had everything prepared, but then my personal problems got in the way. I was worried about a relationship and I tried hard to put it behind me so it wouldn't reflect in my pictures. 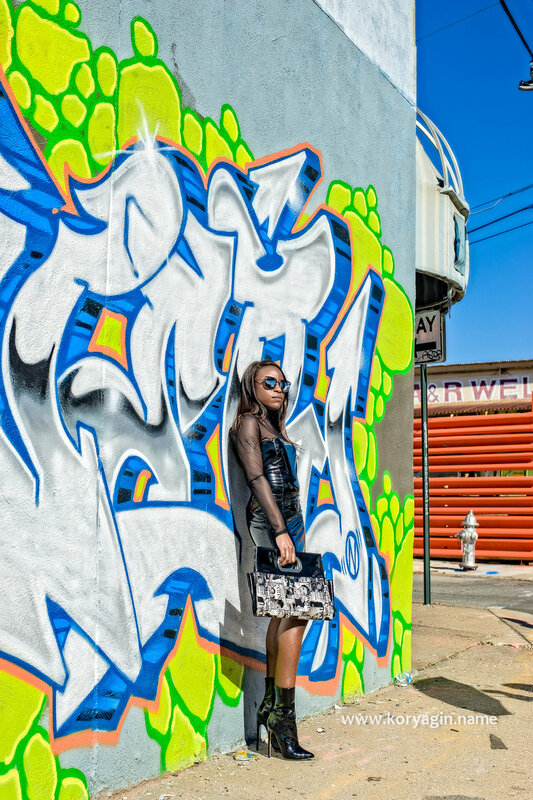 When I arrived at the scene with the colorful graffiti on the wall, instantly my worries and anxiety went away! It was as if I had a genie and I made a wish! I was greeted by the talented photographer Oleg and his assistant/manager with a warm smile, and that's when the magic began!!! I'm loving how I blended in with the wall! I am one with the art!